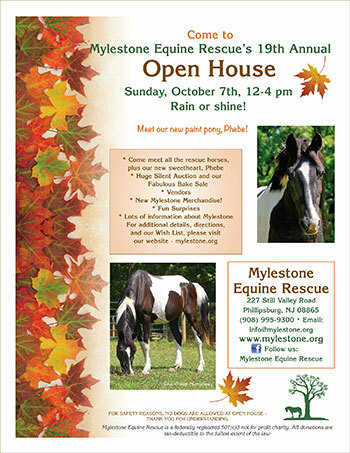 Sunday, October 7th - 12-4 p.m.
We look forward to seeing you at our annual Open House - your chance to come see all the rescue horses in person, meet the volunteers, and find out all the good work Mylestone does on behalf of horses. We know you'll be excited to meet our latest addition, Phebe, a pony who has already come a long way since her arrival over a month ago. Taking care of the rescue horses and promoting responsible horse ownership takes a lot of time, so we are eager to share with visitors what Mylestone is all about. Whether this will be your first time coming or you are already a friend to the rescue, we look forward to seeing you. 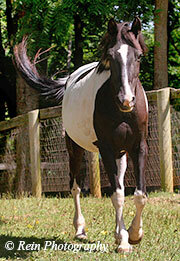 You'll be delighted to meet our rescue horses. They are very well-loved here, and they will come right up to the fence to greet you, eager for a friendly pat on the neck and hello. For those who have always wanted to meet a horse (or two) close-up, this is a great opportunity! Our big girl Livy is a favorite with visitors and knows how to work that fence at Open House! Would you like to help us promote this great event? If you can, it would be greatly appreciated. Simply share this link with those you feel would enjoy Open House or download a high-resolution version of our flyer and post it as you go about your daily rounds. We love to make new friends and Open House is a great place for just that. And there's still more to enjoy at Open House! Each year we have a huge silent auction with gifts, baskets, and unexpected surprise items of all kinds. We also have our now-famous big bake sale with delicious cakes and pies, cookies, breads, bars, and more. We do have food vendors here, but be sure to leave room for dessert! Cupcakes? Ohhh, yes! We always have those! Are you a baker? 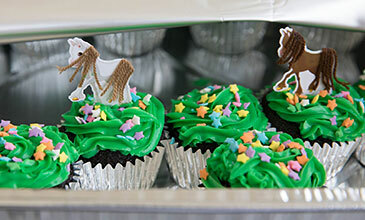 We are always looking for bakers to make the bake sale even more fabulous. Please contact us if you could bake or if you can contribute to our silent auction. You can find more details on what we're looking for here. We are often asked what the admission fee is for Open House. There never has been one and there never will be one, but we do have a request for our guests. We ask that each visitor bring one can of soup which we deliver to the nearby food pantry. Many of our horses were once starvation cases, but once they were all up to their proper weight, they wanted to give back -- how better than to help those that are hungry right here in our area? Important! - Please remember, for everyone's safety, no dogs will be allowed at Open House. 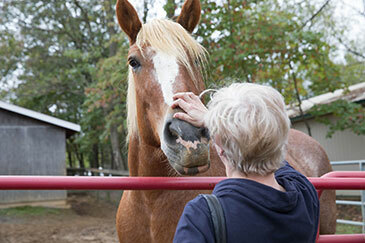 The horses are not familiar with dogs and may spook, potentially injuring volunteers, visitors and/or other horses. Thanks for understanding. Photographs taken of the Mylestone horses are for editorial use only, and may not be used or reproduced without express written permission of Mylestone Equine Rescue. If you have any questions about this, please ask us. Thank you.